This is a guest post from Patrick Campbell, founder and CEO of Price Intelligently. Founders spend a lot of time trying to figure out how to make people love their product. But they really need to spend more time thinking about why people aren't loving it. Figuring out what's stopping people from loving your app helps you build an onboarding flow that makes it easier and faster to help customers with your product. This is essential for retaining customers past the trial period and making sure you have a growing business that generates revenue. At the 2016 Price Intelligently SaaSFest, we got to hear from CEO and co-founder of Drip, Rob Walling, about how Drip iterated on their onboarding to increase their trial-to-paid conversion rate. His advice comes from working on the onboarding flows at two different SaaS companies and can be applied to any SaaS company to multiply trial-to-paid conversion rates.Below, we'll go through the key points of his talk. We'll explain how to find the value that customers come back for, how to implement a four-step framework for onboarding, and how to experiment with customization to create highly personalized onboarding sequences based on user onboarding best practices. 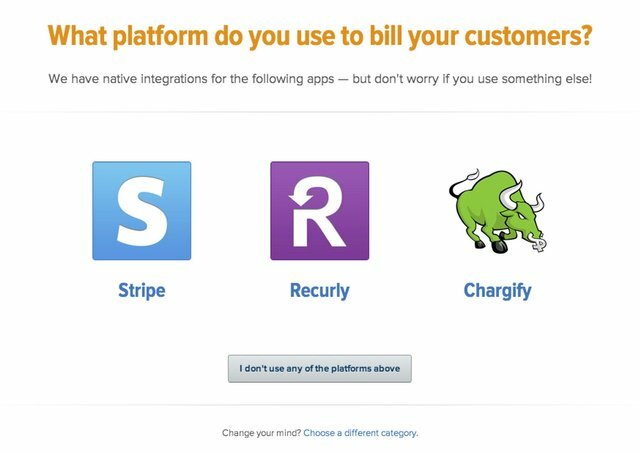 There's only one way to get trial customers to convert to paid. You have to quickly and clearly hammer home that they can't live without your product. Your customers' perceived value of your product is incredibly important to your business fundamentals—and building this perceived value starts as soon as your customer first opens your app. But creating an onboarding experience that does this is a trial and error process—and no one knows this better than Rob Walling. He has a lot of experience building several apps like Hittail, a keyword and SEO tool, and most recently Drip, a marketing automation tool. Armed with a clear picture of your minimum path to awesome, you can start figuring out how to remove the friction points in the path and get customers to love your product as quickly as possible. Rob believes that building great onboarding is a process, and your product will likely see several versions of onboarding. Drip went through four different onboarding experiences in three years. By focusing on experimentation, iteration, and quick improvement, they were able to determine what really worked for their customers at every stage.Iterating your onboarding to keep up with your company's evolution is essential. As you improve your product and add new features, you have to onboard people differently, too. This is one of the best ways you can accelerate growth, show off the most helpful features of your product, and keep staying relevant to your users. We wrapped up the features you needed in Drip so at this point we're ready when you are. I've included a login below (we don't have registration active so I had to create one manually for you). You can get yourself setup whenever you have time this week. Obviously, this level of touch would never be feasible for thousands of customers. But for the first few, it was perfect. As your product changes, your company grows, and you gain more customers, your onboarding process will get more complex. At some point you'll need a more formal onboarding process. Let's take a closer look at each of these steps. When you're a very early-stage company, you'll probably have to guess what your customers love about your product and see what sticks. But as you grow, you'll have the advantage of being able to talk to your existing customers about their onboarding experiences. Ask your customers what made them excited, and ask them how they got to those exciting points. This is the minimum path to awesome that you'll want to shorten. Rob recommends talking with customers that have been onboarded in the last 30-60 days because they'll have the best memory of what actually encouraged them to stick around. Once you know what users have to do in order to see what's great about your product, show them how to do it. At Drip, Rob found that one of the best ways to do this was to put a navigation bar along the top of a user's dashboard. The navigation bar acted as a task reminder for each of the steps that helped a user along the minimum path to awesome. Users could do whatever they wanted in the dashboard, but the navigation bar remained there until they completed the steps as a constant reminder saying, “do this.” This helped remove any friction points around the users forgetting what they had to do. Prompting users to complete these steps in-app led to a 2.5x increase in Drip's trial-to-paid conversion rate. According to Rob, this is the money step: set up an email course with reminders to complete the steps along the minimum path to awesome. Give users tips in the emails about how to do it, and make it really easy for them to take these steps right away. This removes even more friction around customers who forget what to do or don't know how to take the next step. These emails can also serve as progress reminders. You can tell users how many steps they've completed, which gives them a sense of accomplishment, and tell them what they still need to do, which provides motivation. The best part is that this can be incredibly easy with liquid templating. 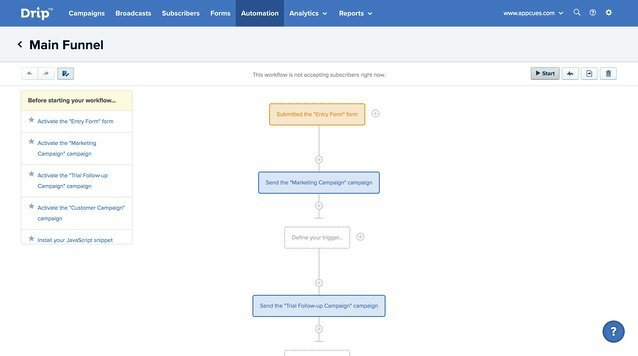 You can set up “if... then” commands to automate emails based on customers' progress and actions. Rob did this at both Drip and HitTail and saw incredible results almost overnight. 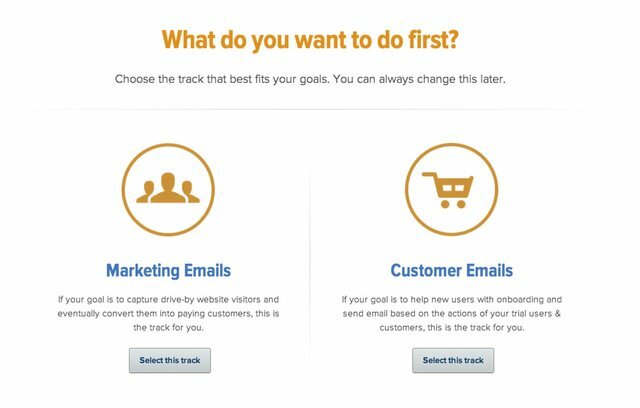 At HitTail, adding an email sequence to user onboarding nearly tripled the trial-to-paid conversion rate. When all else fails, you can offer to literally complete the actions for your customers that will push them along on the minimum path to awesome. Sometimes, even if you remind users to complete steps in-app and through emails, they will still ignore the steps. This may be because the steps themselves require too much work or are too confusing. At this point, you can offer what Rob calls “concierge” services to do part of the setup for them and remove this friction. 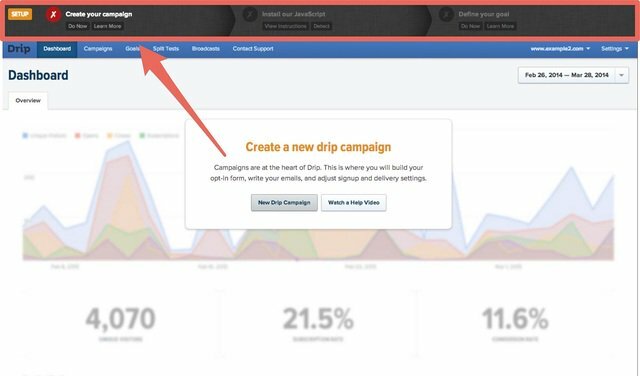 Rob found that at Drip, this was particularly helpful for getting users to create an active Campaign. The team adjusted their onboarding to offer three options for creating a Campaign. 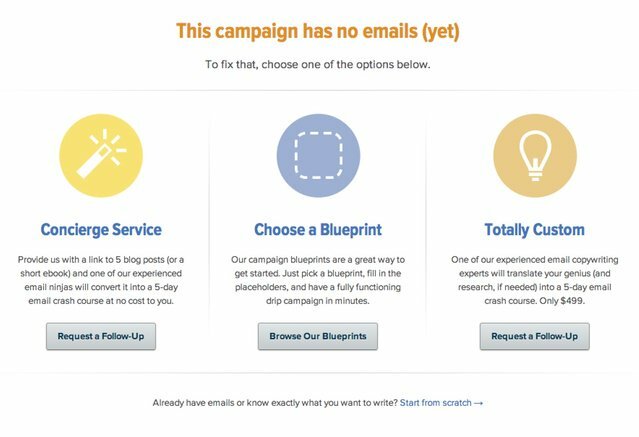 Users had the choice to create the campaign themselves with a Blueprint (which still made things very easy), to provide Drip with some content to put together a campaign themselves, or to pay for a copywriter to create a totally custom campaign with no work on the user's part. 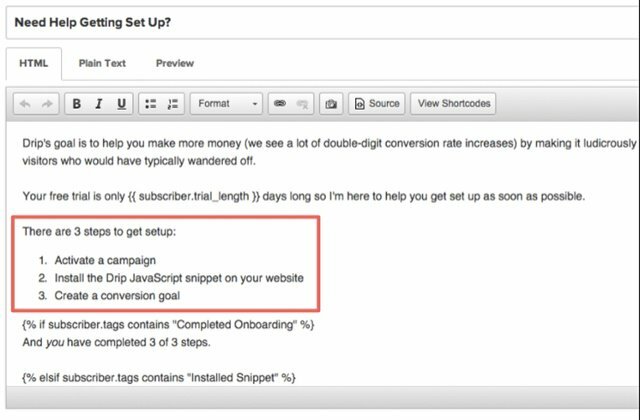 Rob's four-step framework will help you multiply your trial-to-paid conversion rates by telling users what they need to do to succeed, showing them what they need to do, and potentially even doing it for them. It's a great way to set up a directed but flexible onboarding process that will be successful even as your customer base scales. When you've learned even more about your product and your customer base, you can take your onboarding a step further. This is what Rob's team did for Drip's third iteration of their onboarding process. By adding layers of customization to a user's onboarding flow, you can create a setup process around their specific needs. Questions to gather information on what each individual customer wants to do with the tool can come at the very beginning of the onboarding sequence. 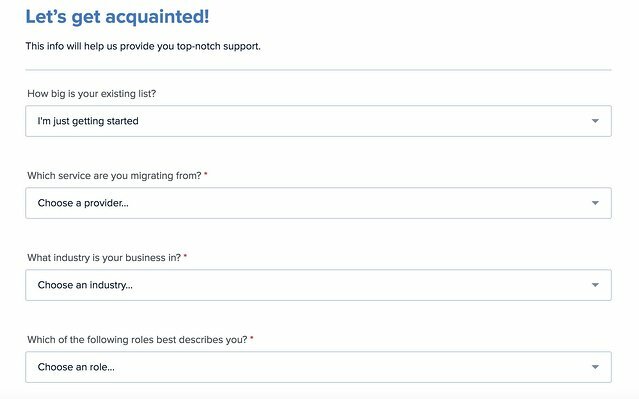 In a recent iteration of their onboarding sequence, Drip added the following questions as some of the first steps in a user's onboarding. Rob recommends asking customers low-pressure questions, and making it clear that they can change their minds later. 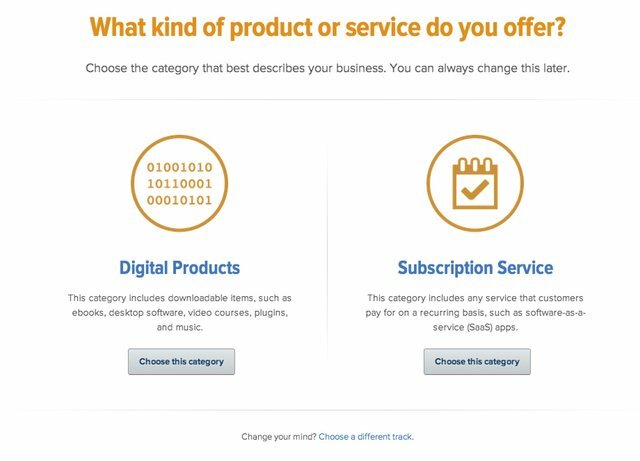 Rob recommends asking customers what other products they use. Then you can tailor the onboarding experience to encourage users to bring in data from those apps. By integrating data of other apps, you're building additional utility for your user and giving them more reasons to engage with your product. At Drip, the team used questions like this to create a workflow around exactly what a user wanted to accomplish with their product. These heavy-duty customizations made paid-to-trial conversions skyrocket. However, Rob points out that they were late-stage iterations of onboarding. They were made possible by a thorough understanding of their product and understanding of customers, which comes with time.You can build yourself up to this point by continuing to iterate. A lot of the changes in onboarding that Rob has been so successful with are things you can get started with right away. You can start asking your customers about their onboarding experiences, finding out what they value most, and finding out what their friction points are. Rob believes that one of the easiest components that anyone can get started working on and see results with is the email sequence. You can write up the emails and then set up an automatic sequence to send them to customers in a couple of hours based on the user onboarding best practices discussed. Ultimately, creating a strong onboarding process will be a combination of quick wins as well as iterations over time. What matters most is staying focused on that minimum path to awesome, and doing whatever it takes to clear up roadblocks that stop users from getting there. Check out the full transcript of Rob's talk, along with a video and slideshow, here. Also, be sure to read more about SaaSFest 2016 and check out the talks from our full lineup of SaaS leaders.